News reports paint a disturbing picture of brutality: waters turning bloody as dolphins are are stabbed and sliced, thrashing helplessly in the hands of gleeful fishermen carrying out this grim deed. But this isn't a scene from Japan's infamous Taiji cove. It's one from the countless accounts of dolphin hunting in the United States which occurred for decades. And while the idea of slaughtering dolphins might be considered abhorrent by most Americans today, and rightfully so, this the legacy of a remarkable paradigm shift which occurred in the not-too-distant past. Dolphins had long been revered throughout antiquity, held in sacred regard as noble creatures in Greek and Hindu mythology, among others -- often referenced as helpers of humanity, alluded to possess an intellectual and emotional capacity that rivaled our own. But by the 18th century that lofty distinction was clearly lost for Americans. Commercial whaling vessels along the Atlantic would show no hesitation harpooning passing dolphins as they cleared the sea of whales. Elsewhere, most notably in the dolphin-rich waters of the Gulf Coast, fishermen were encouraged to target these animals -- which were referred to as "dolphins", "porpoises", and "fish" interchangeably. "Superintendent Mark Riley of the Bureau of Fisheries for Texas, located in San Marcos, says emphatically that PORPOISE MEAT is highly palatable and has begun a campaign, backed by the Food Administration, to encourage the use of porpoise meat as a beef substitute... Porpoise meat has the appearance of venison, the flavor of veal and is the flesh of a fish abundant on the Texas coast." In a little-known and disturbing chapter of American history, the hunting of dolphins soon took a sadistic turn, hunted by fishermen not merely for meat, but for amusement. By the 1920s, tabloids from as far as New York featured epic tales of dolphin hunting with detachable harpoons in the Gulf as though describing an exciting new opportunity for sportsmen. "The wounded porpoise leapt 12 feet out of the water as the sharp pain of the harpoon in its side caused an inevitable convulsion," wrote Evening Graphic Magazine, following the exploits of a wealthy fisherman in 1927. "And then the maddened monster dashed ahead straight for the open reaches of the Gulf of Mexico." According David Sikes, an outdoor writer for the Caller-Times in Corpus Christi, chartered fishing tours would guarantee eager novices the reel in at least one fish or their money back. If they failed to catch anything, captain would make good on his promise by stabbing one of the dolphins that invariably swam alongside the boat as they made their way back to the dock. "Either the mate or parent of the porpoise he had on his line showed a devotion almost human, never leaving the captive one's side from the time it was hooked. He tried in vain to lead the captive one out to sea again, tried to break the line, and at least as Russel was preparing to shoot the one on the line, the other porpoise moaned so pitifully that a woman spectator pleaded for the captive's life." 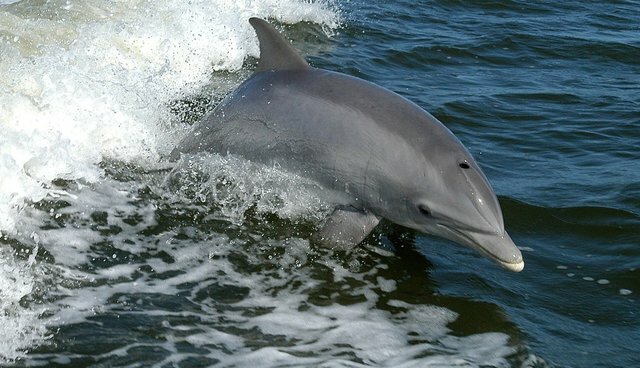 Interestingly, that same issue published a letter written by a reader voicing a rare, quiet dissent in response to calls for dolphins to be culled for eating too many fish: "After all, you know this city is a summer resort and I think Galveston is benefited by the fact that there are porpoises in the surrounding waters. Well, that's a load off my chest. Thanks cordially. -H.W." Even though dolphin hunting continued long after, what happened in the years that followed offers a lesson in how wholly public attitudes can shift, as dolphins went from fish-like to nearly on par with humanity. The early days of the Cold War Era and the looming threat of atomic annihilation transformed previous conceptions of mankind's permanence and place in the universe, from dominant to destructible. In this insecurity Americans began to look elsewhere, projecting their fears and hopes towards the thought that intelligent life might exist beyond them -- a palpable sense encapsulated in countless science-fiction novels and movies of the time. Were we really alone? In the 1950s, neuroscientist John C. Lilly, began to publish studies indicating that dolphins were far more intelligent than anyone had understood before -- possessing large, complex brains not so unlike our own. Though much of his research, particularly in suggestions that bottlenose dolphins could be capable of human speech, was fueled by his own experimentation with LSD and later deemed unconventional, it sparked the imagination of the American public who purchased Lilly's books in droves. We weren't alone after all. Thus began America's love affair with an animal that had long been hunted. It's no wonder that in 1964, the year that the gloomy "Twilight Zone" ended its run, a new show premiered featuring the extraordinary (albeit often fictional) abilities of our newfound counterparts -- called "Flipper." By 1972, the U.S. Congress passed unprecedented protections for a natural ecosystem and its inhabitants -- the Marine Mammal Protection Act -- shielding Flipper, and all dolphins, from being hunted. That same decade, the beloved cosmonauts venturing into the distant realm of space found contemporaries in others exploring the depths a bit closer to home. Jacque Cousteau became famous for his work in marine animals, publishing a book called "Dolphins" in 1975, which further cast international attention on the species and our place on Earth. "The sea, the great unifier, is man's only hope. Now, as never before, the old phrase has a literal meaning: we are all in the same boat," Cousteau wrote. Since then, research into dolphins and other cetaceans have only deepened our appreciation of them, seeded just a generation ago after decades of killing them. Dolphins, perhaps more than any other animal, reflect back a sense of ourselves we fear may have been lost in our strive for modernity -- again, at long last, a bit like sacred beings. Today's dolphin hunts, like the one underway in Taiji cove, prove that this perspective is not yet universal -- though the momentum of human progress to better understand ourselves and the world around us surely makes it an inevitability, and a welcome one at that.